Do your friends sometimes send you emails with touching stories they've received, encouraging you to forward them to other people? I get my share, and sometimes I actually do send them along, if the stories are true and if they highlight some of the personal strengths that I write about. Recently a friend of mine forwarded some photos and a story about a dog that was born with only his two hind legs. The dog's own mother wouldn't nurture him, and apparently his owner thought he might not survive and considered putting him down. Then a woman named Jude Stringfellow fell in love with the dog and adopted him. She called him "Faith." 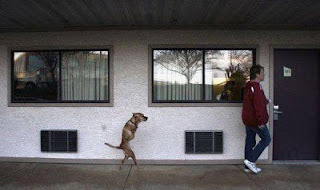 As the puppy grew up, Jude taught him to stand on his two hind legs and eventually trained him to walk like a human. Now she takes Faith to groups to amaze them and share her message of optimism. She's written a book called Faith Walks and has an official Faith the Dog website. Do you have problems or disappointments in your life? Physical infirmities? I know I do. Who doesn't? 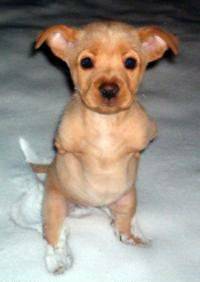 But if a puppy with only two legs can respond to encouragement and persist to learn to walk upright like a human, then I can exercise my own faith, optimism and perseverance to overcome anything that might try to hold me back. Jude Stringfellow has a long and torid track record. Be careful if you work with her. She owes my company money and has been avoiding service. This is so great that you guys did this. 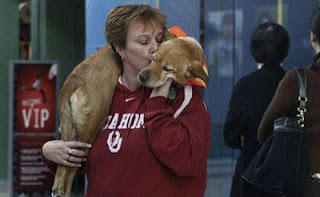 It really helps these guys get noticed out in public at adoption events, making them more likely to be adopted. We foster and volunteer with our local Golden rescue and love to do it. The dogs repay you tenfold!